Quilt Story: $75 Giveaway from Fabric Shoppe! Fabulous giveaway today from one of our best sponsors, Jody from Fabric Shoppe...she's awesome! I've always loved the collections she carries, some really cute stuff. 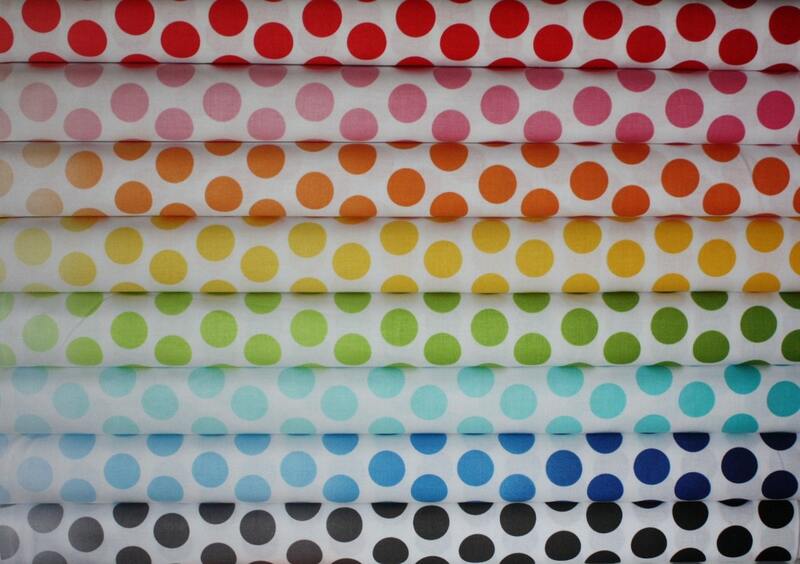 Ombre Dots from Riley Blake...what a fabulous stash builder. So many ways to use these! Can't beat the chevrons...I've used them so much already I keep adding more to my stash! Now if you need to shop this instant, comment to win and then head over. Use the coupon code QUILTSTORY to save 10% all week! Fabric Shoppe also has an awesome customer appreciation deal, $1.25 fat quarter, a new one each week! Love that! Next day shipping as well, can't beat that! And Jody has a very generous giveaway for our readers today! YAY! 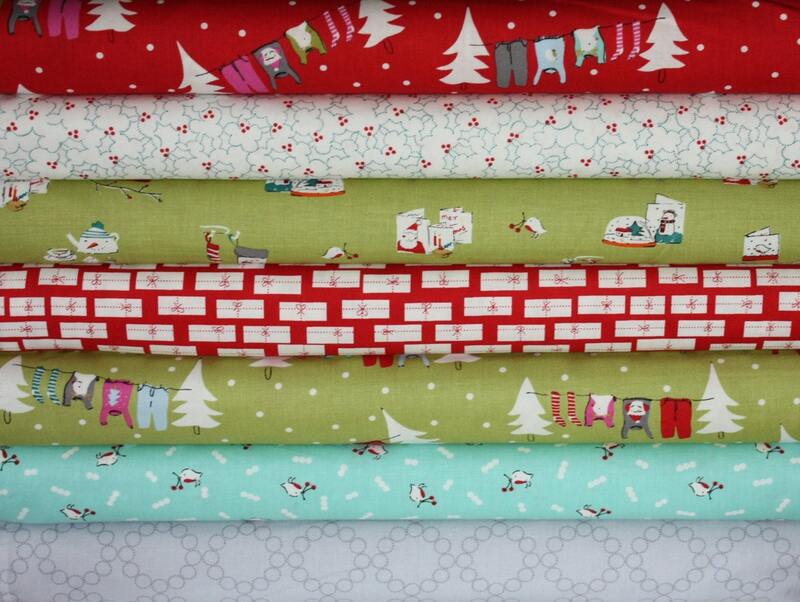 How would you like to win a yard bundle of Cherry Christmas from Aneela Hooey (7 total!)? I want this in my stash!! 1. Stop by the shop and let us know your favorite item. One can never have too many dots. Awesome giveaway!!! Thanks for the chance to win. I really like the The Simple Life quilt fabric supplies by Tasha Noel. Love the Simple Main in Pink. Let's see...ONE of my favorites is the Oh Deer line. So cute!! I am a Facebook 'like'r person :) Wonderful fabric giveaway!!! Been over to the well stocked shop and see Field Study - yum!!! I've liked Fabric Shoppe on FB. I've followed Fabric Shoppe on Pinterest too! And also Twitter. Thank you! Is this giveaway for all the worldwide?? I loved Cherry Christmas fabric!! Awesome!! I love the Oh Deer line and of course the chevrons! Thanks for the intro I'd not come across Fabric Shoppe before - lovely stuff. My favourite is the Navy 2D Zoo Quilt Bundle - really delicious fabrics. I would love the field study fabric by Anna Maria Horner. So pretty! Love Christmas fabric and her line. Christmas is my all time favorite time of the year. Been having my eye on Joy by Kate Spain. Thanks for the chance. I follow Fabric Shoppe on Facebook. Thanks for the chance. I follow Jody on Pinterest. Thanks for the chance. I really like Oh Deer! The Cherry Christmas of course! Sure, I'd love to win! I really like the Alexander Henry 2D Zoo bundles. I love that feature fabric! I love the Joy bundle and Cherry Christmas bundles too! My favorite item in the shop is the Surprise in Your Mailbox Scrap Pack. I seriously have a scrap addiction! I follow Jody on Twitter. I liked Jody's Facebook page. I also follow Jody's Pinterest boards. I love the Boy's Field Trip- Urban Zoologie and Remix Fabric FQ bundle! What an amazing giveaway! My fav item is the Simple Life bundle! I love the Navy 2d Zoo Quilt Bundle. Would love to win! I like the Joy bundle from Kate Spain. I also already follow on Twitter! Thanks for the awesome giveaway! Love the Simple Life bundles! I liked the Fabric Shoppe on facebook! I followed Jody on pinterest. I love those ombre dots! Thanks for the giveaway! I liked Fabric Shoppe on fb! I follow Jody on pinterest! I follow Jody on twitter, too! I love the Field Study and anything Aneela Hooey! I follow Jody on Twitter! I would love to have this gorgeous fabric to play with. Wow - very generous giveaway! 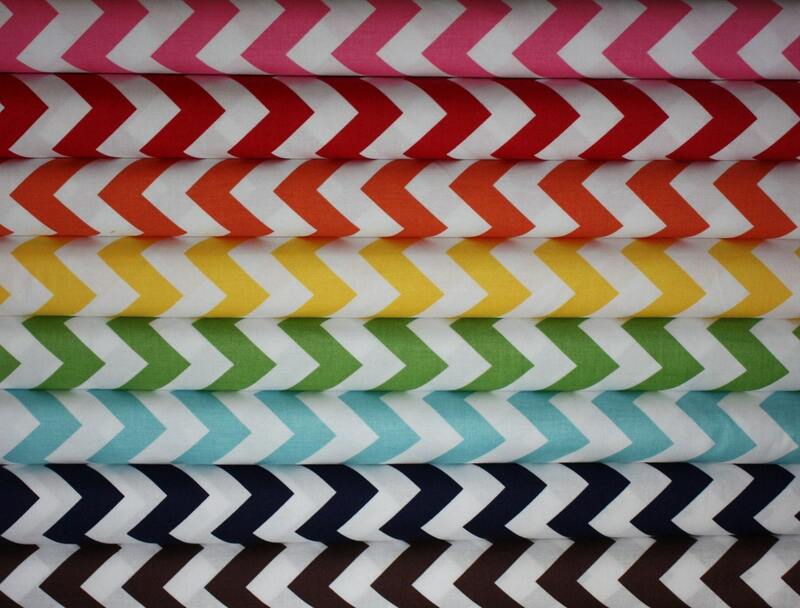 The fabric that jumps out at me right now as one I want to buy is the Urban Zoologie, Metro Market Stripe in Bermuda -- that fabric would be fabulous as binding on a few projects I have planned. My favorite bundles are half yards, and shes' got a great selection. I would love to have one of those hombre dots. I Follow several categories on Pinterest. Love that place! Oh my...nice gifts! Love the dots and chevrons. I love the Flea Market Fancy Legacy Collection bundles! Thanks for the chance to win! I'm in love with the Simple life collection!!! My fave is the Santa's workshop bundle! great selection. Also, I followed on pinterest. I love the Santa's Workshop fabric bundle! My favourite is Fleamarket Fancy. Just love this line! And I already follow on facebook. And I also already folly Jody on Pinterest. Well I.love them all! Lol but one is Gypsy Caravan! The chevrons and dots are just what my stash needs! Thanks for the giveaway. I'm still in love with anything FMF! Thx!!!! I am following Jody on Pinterest! I don't think there is a fabric I don't like at Fabric Shoppe but I really like the bright colors of Pretty Little Things fabric by Free Spirit. The Cut and Sew Fabric would make an adorable machine cover too! That Oh Deer is so adorable. Love MoMo's designs. I follow Jody on Pinterest. Thx!! I love the "Joy" Christmas fabric!!! I would love a pezzy print bundle from the shop. I know it is not a new print but I have wanted some for just about forever! I am following on Pinterest. Thanks for the giveaway! I love the Pretty Little Things fat quarter bundle! Pick me! I love the dots bundle, wonderful for everything! But I am also totally in love with the deer from Oh Deer, so any of those prints are on my wish list as well!! I "liked" Fabric Shoppe on Facebook! Have followed Jody on Pinterest! Excited to see what she pins!! And I am following Jody on Twitter! Thank you for such a generous giveaway! My favorite item at her shop is the "Create Your Own Bundles." It has helped me out a lot in the past! I love The Simple Life! It's so sweet! I follow her on Pinterest. Thanks again! I like them on FB... thanks for the chance to win! I love the Oh Deer fabric bundles -- such a sweet line! I also follow Jody on Twitter. Thanks for the chances to win such a generous prize!! I love the simple life fabric bundle! Christmas Joy by Kate Spain is my favourite bundle. Like Fabric Shoppe on FB! HELLO! I'D CHOOSE THE "OH DEER" COLLECTION AT HER SHOP! THANKS FOR A CHANCE TO WIN A BEAUTIFUL PRIZE! I'd love to have the Ombre Dots or the Chevrons, they'd cover some gaps in my stash just perfectly. The Fabric Shoppe is a lovely shop with great bargains! Thank you for this giveaway and good luck to all who have entered! I went to the shoppe and there are so many to like! I know that the medium dots would be very at home in my stash! Thanks for the chance! I LOVE all of the different polka dot fabrics! 'tis the season ... i like Cherry Christmas by Aneela Hooey for my stash to work up for christmas! so, would dearly love to win the bundle! thanx for the chance to do so. i follow the shoppe on fb. Wow great fabric!!!!! love the Christmas fabric!!!!! I love Oh Deer Japanese quilt fabric blue bundle by Momo for Moda. I "like" Fabric Shoppe on facebook. Great giveaway! Love the Cherry Christmas Fabric and all the dots bundles. Thanks for a chance to win! a surprise in my mailbox!! So much great fabric to try to choose from and fabric surprises are always welcome! I'd have to say the Oh Deer is grabbing my attention. 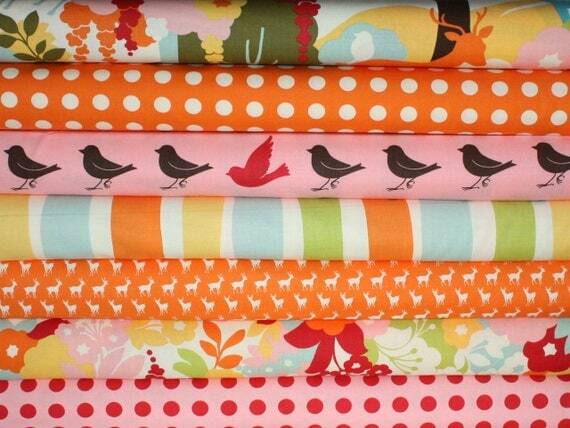 The colors in Lori Holt's collection are so pretty in the Fabric Shoppe bundle. I also like the various bundles of Oh Deer. OMG there is such a variety and so much I love!! If I had to choose right this second it would be Flea Market Fancy!! Thanks for the chance! I am following some of Jody R's Pinterest boards!!! I am following Jody R on Twitter (@mimistarquilter). Thanks for another chance!!! That bundle makes me happy! If I weren't buying up Cherry Christmas, I'd go for The Simple Life. Any and all of it. Times three. I'm already a facebook "liker" - love getting her status updates for the shop! And I follow Jody on pinterest. I'm loving the bundle of Ombre dots! I 'liked' her on facebook! I'm loving the dots! The ombre dots, the medium dots - Love the rainbows of color! I've liked the Fabric Shoppe on facebook. I follow Fabric Shoppe on Facebook. I follow Jodi on Pinterest and Twitter. I follow Jody on twitter (@mollywhitehead). I love the Urban Zoologie prints. So cute! my fav is the Oh Deer fabric - I love that line! :) thanks for the giveaway! I love all Aneela Hooey fabrics! The ombré dots are just awesome, eh? I already liked the shop on fb. Being a pink fan, and loving the oh, deer fabric, I would say my current favorite in the store is the Pink Oh Deer fabric set. Wow, there are some great bundles there! I love the "Oh Deer" bundle in green, brown, and blue. Looks great! I really love the Oh Deer fabrics, they are so cheery and quirky. I definitely LIKE Fabric Shoppe on facebook. Ombre Dots by Riley Blake -- they're my fave item in the shop! Oh my goodness I love the Cut and Sew Fabric by Cynthia Frenette. Enchanted Forest in Creamsicle from the Oh Deer line is so charming. The dots and chevrons are my favs!